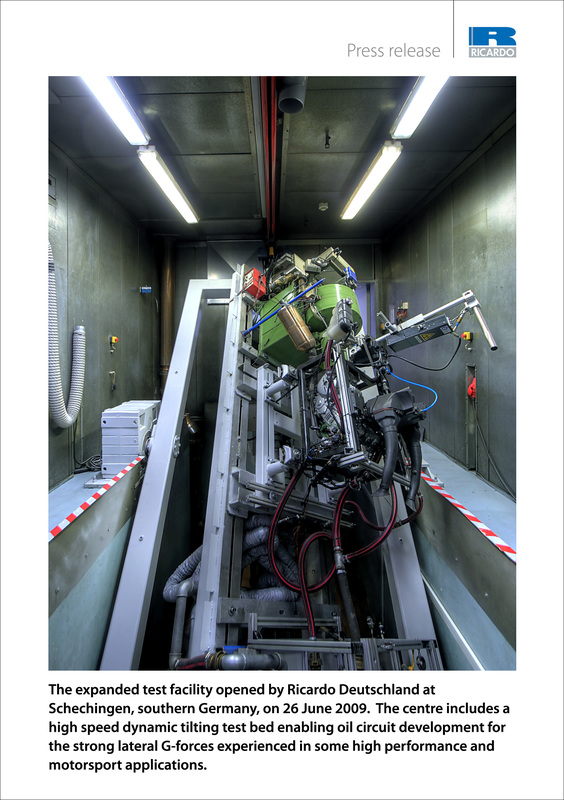 With the increasing need for vehicle manufacturers to deliver lower emissions, improved fuel economy and ever higher standards of product durability and performance, access to state-of-the-art testing infrastructure has never been more important. The German subsidiary of Ricardo, Ricardo Deutschland GmbH, has seen a sustained rise in the demand for its engineering services over the past three years, particularly for projects carried out for heavy duty truck and motorcycle manufacturers. 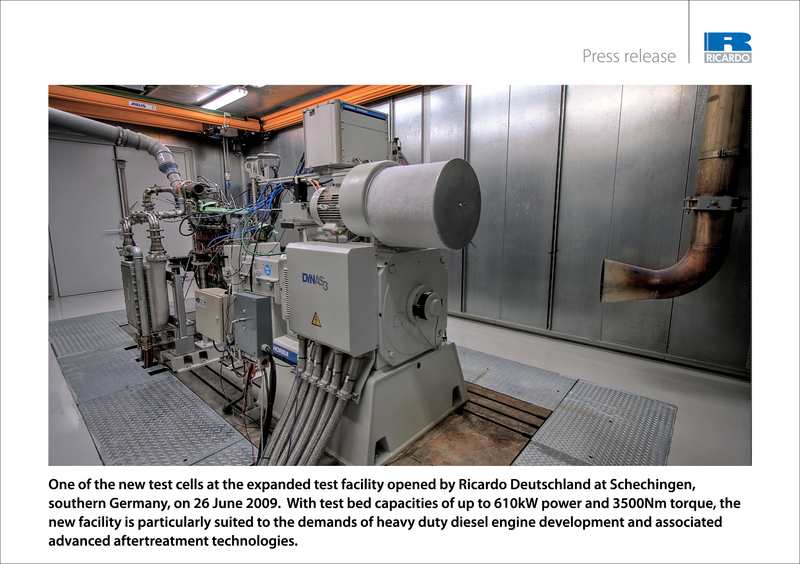 To meet the additional requirements for advanced testing generated by this growth in business, the company today opened a new 800 square metre extension to its powertrain test facilities at Schechingen, close to the headquarters of Ricardo Deutschland GmbH in Schwäbisch Gmünd, Southern Germany. Flexibility is a key characteristic in the design of the newly expanded test facility which is amongst the most advanced in the European auto industry. With test bed capacities of up to 610kW power and 3500 Nm torque, it is particularly suited to the demands of heavy duty diesel engine development and associated advanced aftertreatment technologies, such as selective catalytic reduction and lean NOx trap systems, that are likely to be required to meet Euro VI emissions. At the same time, with dynamometer speeds of up to 10,000 rev/min and a dedicated dynamic tilting test bed enabling oil circuit development for the strong lateral G-forces experienced in some high performance and motorsport applications, this same test facility will equally be able to support the rapid expansion of the company's motorcycle and small, high performance engine business. The expanded facility includes two new fully transient powertrain test cells - bringing the total for the facility to 15 - incorporating the latest HORIBA/STARS control systems together with a range of advanced exhaust measurement technologies, including spectrographic analysis. In addition to this, the facility will include an 800kW hot gas component test cell for the development of specialist exhaust systems for premium products and exhaust heat recovery technologies, as well as a new powertrain assembly area and office accommodation. Today's inauguration of the new test facilities is part of an on-going strategy being followed by Ricardo of expanding its testing capacity in Germany to support the continuing growth of its business in Europe's largest automotive market. The new 800 square metre extension also includes space for a further two high specification powertrain test cells, one of which is due to be commissioned in early 2010. Furthermore, the company has acquired an additional 4000 square metres of land adjacent to the test centre to accommodate further expansion in the coming years, in order to further support the future growth of its business. 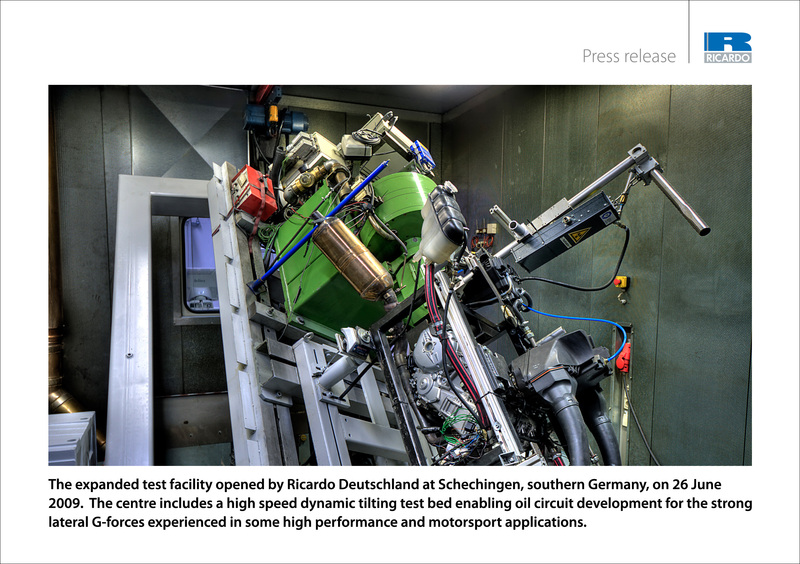 "Ricardo has enjoyed a period of dramatic expansion of its engineering service business in Germany over the past three years and it is important that we are able to offer our customers access to a comprehensive range of flexible and technically advanced test facilities to support their product development programmes. Our investment in this newly expanded test facility will provide, for example, a crucial enabling capability in assisting our heavy duty customers to achieve the requirements of Euro VI emissions, as well as our passenger car customers to meet the European goal of achieving a 130g/km CO2 fleet average." Ricardo plc: With technical centres and offices in the UK, USA, Germany, the Czech Republic, France, Italy, Russia, China, Japan, India and Korea, Ricardo is a leading independent technology provider and strategic consultant to the world's transportation sector industries. The company's engineering expertise ranges from vehicle systems integration, controls, electronics and software development, to the latest driveline and transmission systems and gasoline, diesel, hybrid and fuel cell powertrain technologies. Its customers include the world's major vehicle, engine and transmission manufacturers, tier 1 suppliers and leading motorsport teams. Ricardo is committed to excellence and industry leadership in people, technology and knowledge; approximately 70 per cent of its employees are highly qualified multi-disciplined professional engineers and technicians. A public company, Ricardo plc posted sales of £197.7 million in financial year 2008 and is a constituent of the FTSE techMark 100 index - a group of innovative technology companies listed on the London Stock Exchange. For more information, visit www.ricardo.com.